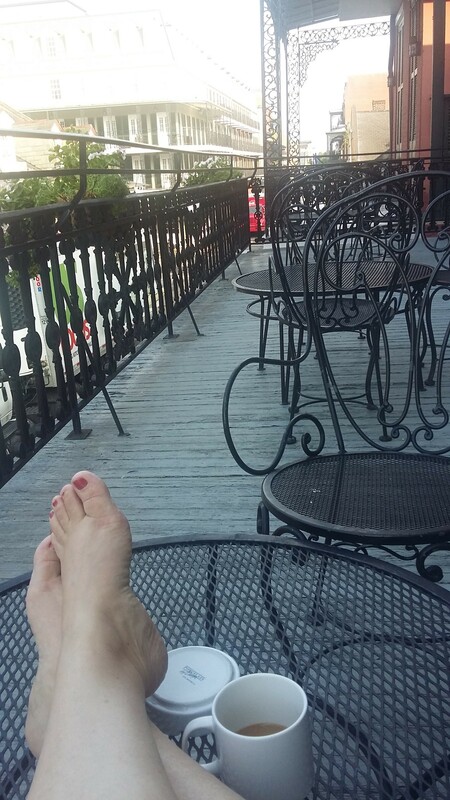 Relaxing on the balcony at Hotel Maison de Ville. The sky lit with fireworks and I sat in awe of this feeling that is New Orleans. Watching the brilliance light up the sky, I chuckled that I had almost passed up NOLA on this trip because I would be by myself. Never having visited New Orleans before, I had images of Mardi Gras, beads, and dancing in the streets. Plus, 10 years after Katrina, I also had thoughts of pain, struggle, and the eventual triumph and rebirth of this ancient, resilient, city. I didn’t want to miss the chance to experience this majestic city, so I went alone. After traveling more than 30 hours via Amtrak, I arrived late afternoon, crossing Lake Pontchartrain on the final leg of the journey. The train tracks cross directly across this massive body of water and it feels as if you’re floating through. Then there are the marshes and wetlands–and I had arrived. 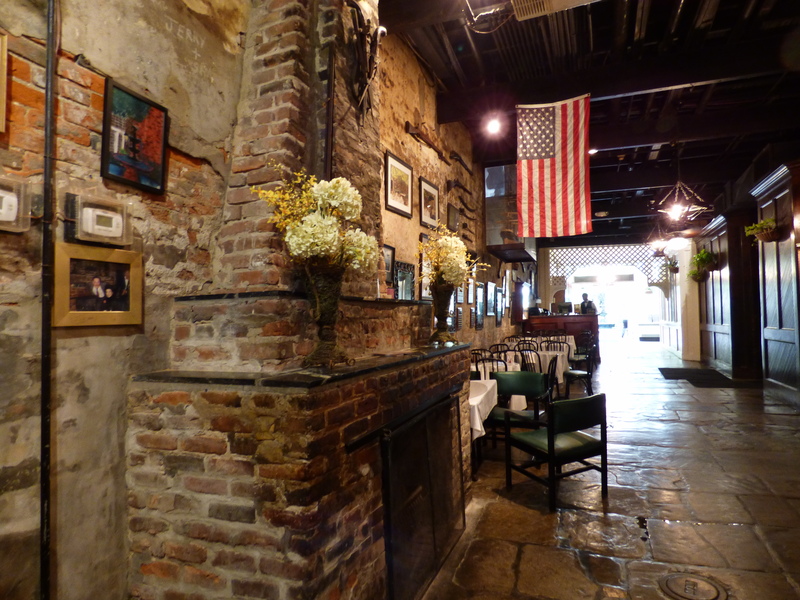 The Hotel Maison de Ville, located in the French Quarter, is only two miles from the train station, so it was a quick taxi ride. I rang the doorbell and was welcomed into this charming, historic townhouse. Built in 1783, the three-story building was at one time home to Tennessee Williams. 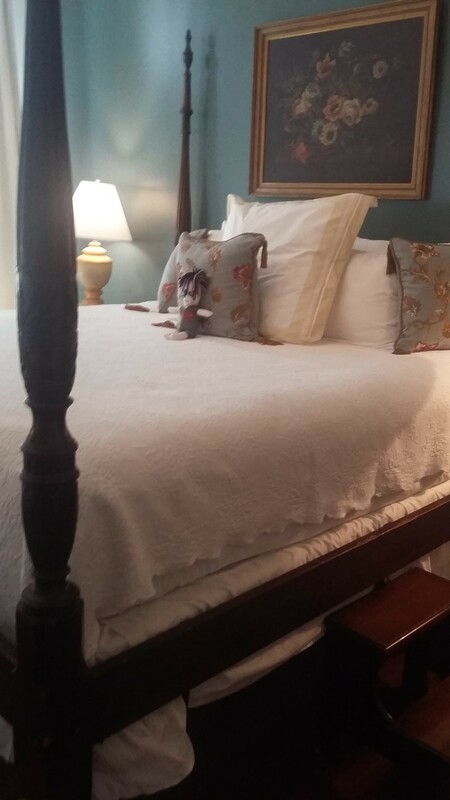 My room had antique and period furnishings and a full-size canopy bed topped with a voodoo doll. Tired from the long trip, I wanted a simple evening. I ran next door for a slice of pizza, a salad, and a beer at Little Vic’s, then back to my room to enjoy the rest of the evening listening to music and people-watching from the balcony. The next morning I awoke rested and ready to explore. I wanted to try as many authentic foods as possible, so decided on a Jazz Brunch at Court of Two Sisters. The Jazz Brunch is a feast unlike any I’ve seen with row upon row of fresh, seasonal, authentic Cajun foods. Of course, there were eggs, but I had to try their famous Turtle Soup Au Sherry, the chicken and andouille gumbo, the etouffee, and a crawfish pasta salad. 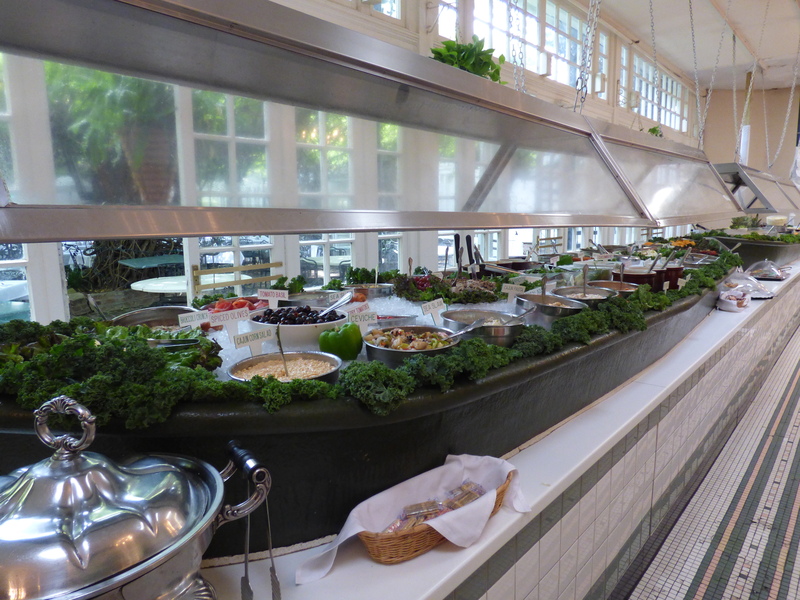 The atmosphere combined with an exquisite combination of authentic New Orleans cooking made for a delightful brunch. A magnificent brunch at Court of Two Sisters. Needing to walk off some of the food from brunch, I took a walking tour of the French Quarter, including an afternoon café au lait and beignets at Café du Monde. 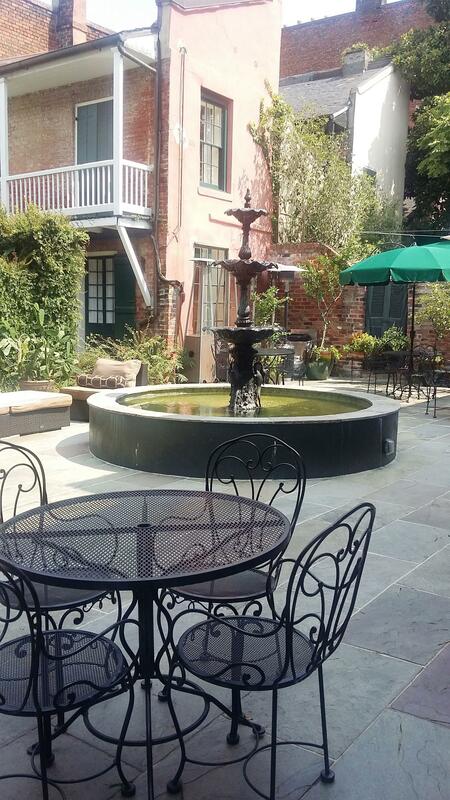 I had planned on taking a ghost tour in the afternoon, but instead returned to my room for some air conditioning and then an afternoon spent in the shade of the courtyard at the hotel. 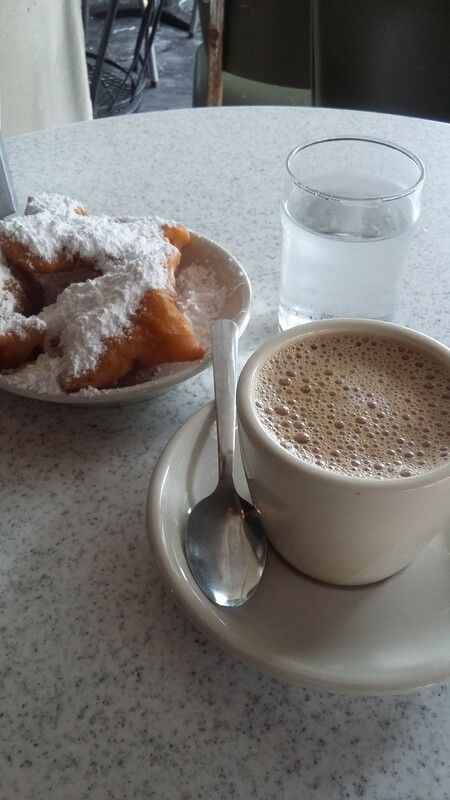 Cafe au lait and beignets at Cafe du Monde. The courtyard at Hotel Maison de Ville. I could hear the city coming alive again as evening fell so I took off on foot to find dinner. I walked a few blocks until I discovered a charming place called The Old Coffeepot Restaurant. It was a leisurely dinner. Even though I was by myself, my waiter didn’t rush me. To the contrary, he was flirty, informative, and a delight. He recommended and I ordered the Triple D. The Triple D is named after the three items featured on The Food Network’s Diners, Drive-ins, and Dives when Guy Fieri visited the restaurant. The plate consists of Jambalaya, a green bean casserole, and the Fleur de Lis Chicken. 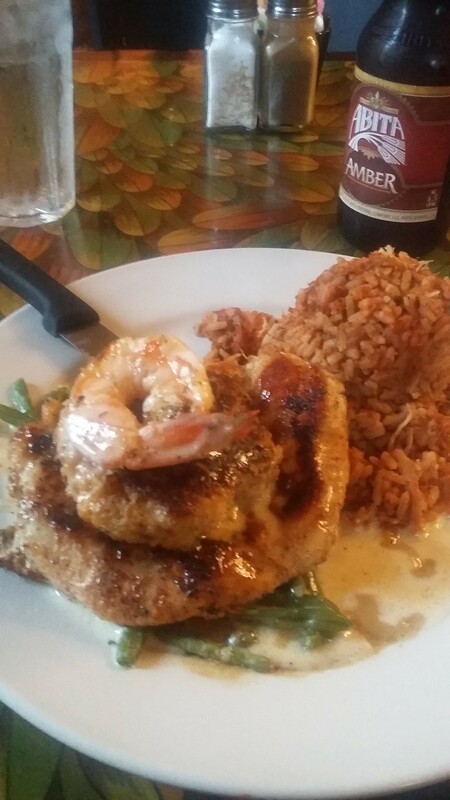 The Fleur de Lis Chicken was heaven on a plate: a tower consisting of a grilled chicken breast topped with a crab cake and one shrimp on top with beurre blanc. The Triple D at The Old Coffeepot Restaurant. The next morning, departing for an early-morning train, I checked out of the Hotel Maison de Ville before first light. Partiers were still wandering the streets and it was a surreal feeling to see them still celebrating. My taxi driver was a woman with a thick accent. When I told her about my dinner at The Old Coffeepot, I mentioned that the shrimp on top was the largest I’ve seen. She said, “We have oysters (she pronounced it, “ersters”) when they’re in season and we have shrimp when they’re in season. The shrimp you had was a small one. We save the big ones for ourselves.” And from our delightful conversation in the early morning light, I loved this city and its resilient people even more. 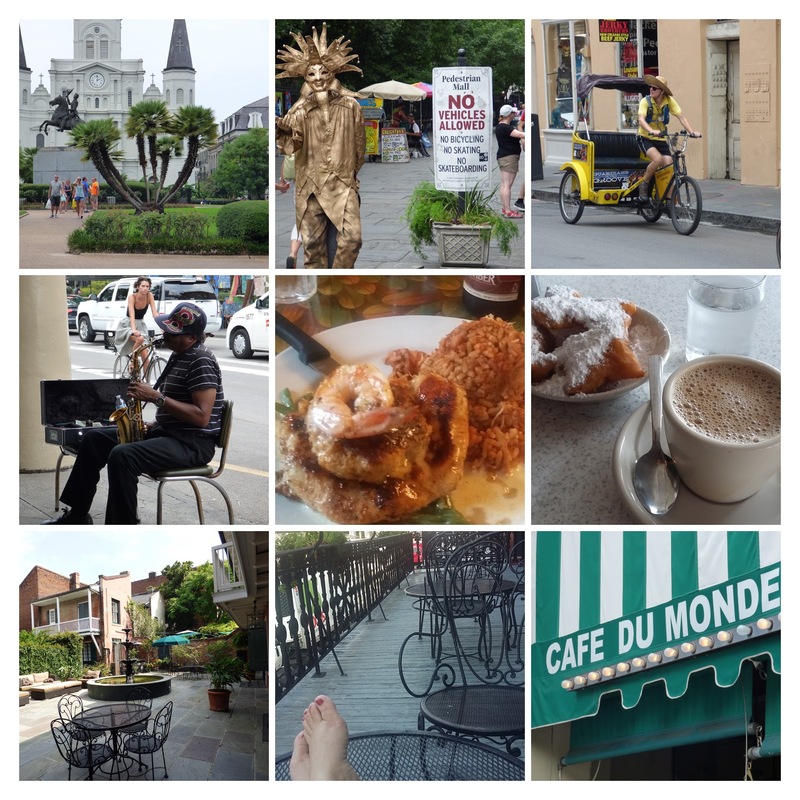 Traveling solo gave me the opportunity to see New Orleans in a different light and more intimately than if I was with a group of friends. Whether solo or with friends, though, I know the city will call to me and I’ll return. I’m glad you had such a great time! Very nice description. I think I’d prefer lodging without the voodoo doll, though. Haha, yes, but the voodoo doll added to the ambiance. Especially after I heard the hotel was haunted. I’ll admit I heard some pretty spooky sounds in the night but I racked those up to an old building and a wild imagination.